I don’t know if you have ever been to North-Norway, or even are planning a trip there. But in case you are, you should know this: Visiting during the summer months involves a very high risk of being in constant war with the fierce creatures somewhat erroneously called mosquitoes. We are not talking about the small innocent kind that will give you an annoying bite and leave you with that. We are talking about wicked, jumbojet-sized, killing machines. And they come in billions. Armed with all kinds of weapons yet not fully understood by mankind, they will attack you constantly and will not leave you alone until you are all but a pulsating mass of hurt. 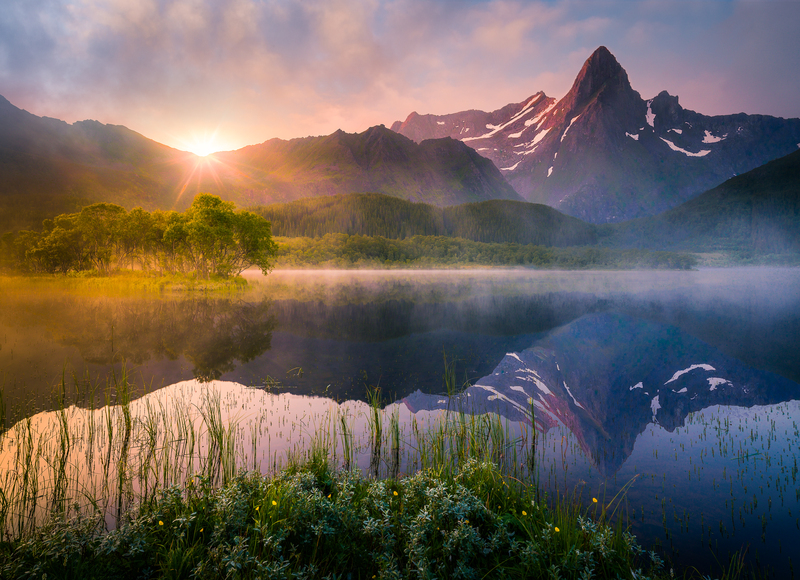 This early morning in July, a photography buddy and I were driving around Vestvågøy in Lofoten when we saw this beautiful mountain reflecting in a small, mist-covered lake. Like the sirens in the Odyssey we could hear the marshland calling our names. Oh, we were so naïve. Little did we know of the evil that waited. We parked the car and wandered through the dense forest towards the lake. Half-way out on the marsh we understood the lure and the mistake. Armed with only a small innocent Hasselblad (! ), a few lenses and a Gitzo series 5, I didn’t stand a chance. No hope for backup either. My buddy was already kicking and screaming in pain from the other side of the marsh. It got messy. For us, not the mosquitos. Miraculously, I managed to set up my tripod and capture a few frames before we fought our way back to the relative safety of our car. Days, even weeks, of pain followed. I haven’t had the courage to sit down and process the images before now, fearing it could wake up the evil again. PTSD I think they call it. When I finally manned myself up and started looking at them the other day, it looked like someone had combed their cat over my sensor. But there was no dust on my sensor. Only clouds of evil in the frame. I stared to use the clone-tool, but soon gave up and just exchanged the blurry mosquitocovered skies with the skies from another image captured later that morning. I think the result came out ok, but as you may understand, I have somewhat ambiguous feelings about it…. Wow, thanks a lot smackedpentax! Appreciate it!